The second largest quake, of 2.6, took place at 1.23pm on Sunday in the same area, while the third quake erupted at midnight on Monday, reaching a magnitude of 2.1, according to the Volcanological Institute of the Canary Islands (Involcan). 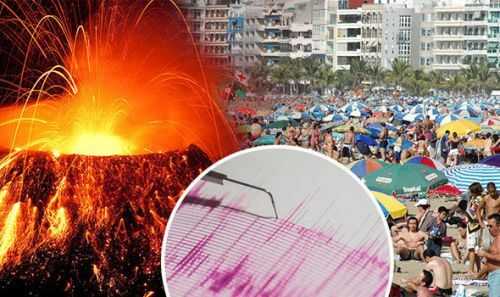 The earthquakes have sparked panic across the Canary Islands, with volcano experts pulled in to examine the unusual seismic activity. The Ministry of Territorial Policy, Sustainability and Security of the Government of the Canary Islands, respecting the Special Plan for Civil Protection and Emergency Care for Volcanic Hazards, will meet with the Scientific Committee of Evaluation and Monitoring of Volcanic Phenomena, to evaluate the data obtained from monitoring stations on the island. A scientific team of five will also visit La Palma to keep track of the tremors in situ. Ms Blanco said the team will start to increase the number of seismic stations in the volcanic monitoring network in a bid to develop the geochemical measurements usually carried out in the island of La Palma. So far, the earthquakes have not been felt by residents because they are occurring at a great depth. The last significant seismic activity in the archipelago took place in 2011 on the island of El Hierro, which finally led to the eruption of an underwater volcano in the southeast of the island. The eruption was followed by more than 7,500 earthquakes, which lasted for three months. La Palma is a volcanic ocean island, which rises almost 7km above the floor of the Atlantic Ocean. There is road access from sea level to the summit at 2,426metres, which is marked by rocks called Los Muchachos. It was originally formed as a seamount through submarine volcanic activity and is currently, along with Tenerife, the most volcanically active of the Canary Islands. The island is composed of two large volcanic centres. The northern part of La Palma is dominated by the older Taburiente, with a width of 9 km and a depth of 1,500 metres and is surrounded by a ring of mountains ranging from 1,600m to 2,400m in height. Around a half a million years ago, the Taburiente volcano collapsed with a giant landslide, forming the Caldera de Taburiente. But the younger 1949-metre-high Cumbre Vieja, the southern volcano, is one of the most active in the Canaries.